This games simulator is another incarnation of Alpine Racer, where the player experiences a real adrenaline rush by skiing an amazing downhill course of their own choosing. This is a checkpoint style racing game, with lifelike physics and a unique set of controls. The players compete with other players, attempting to ski down the course quickly enough to beat the times set by the competition and qualify for the next stage. 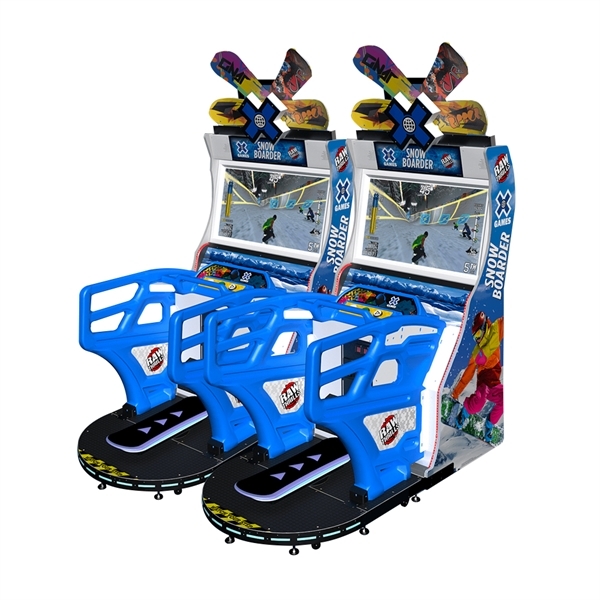 Alpine Racer 2 is an exciting and entertaining games simulator and will amuse and entertain any winter sports fans, whether they are a novice skier or an expert. 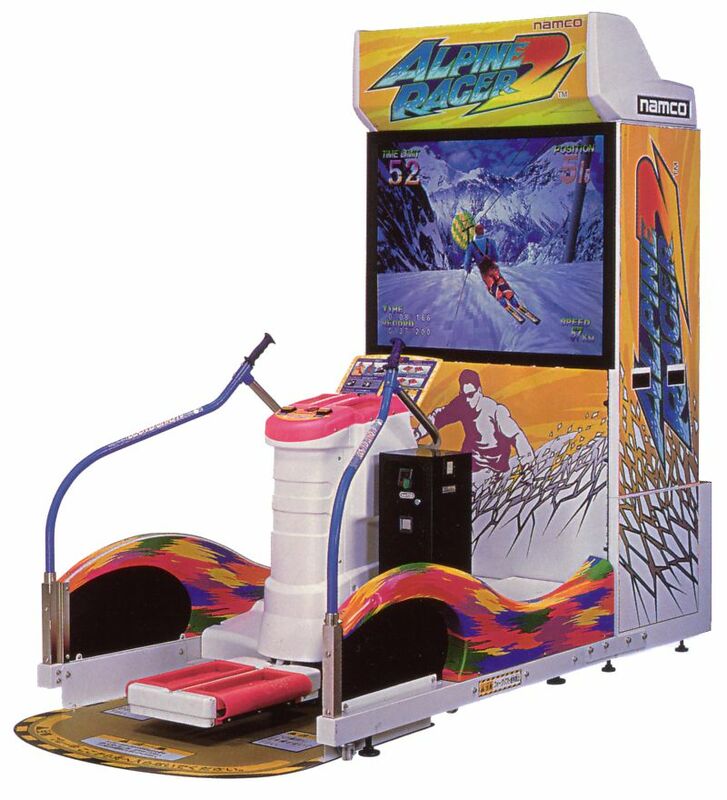 Each player will be keen to set the best possible time and see off the competition, and it is the competitive aspect of Alpine Racer 2 that will keep all your guests engaged, whether they choose to compete or not. 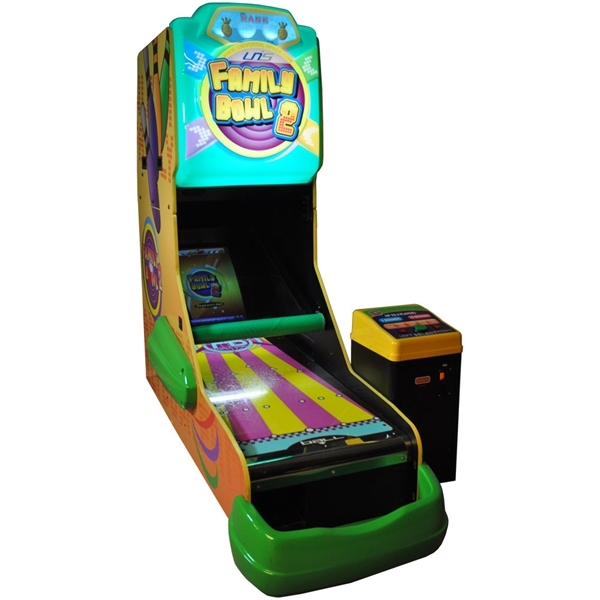 Two machines linked together create a fantastic competitive atmosphere at any function. A recent remake of a Namco classic, Super Alpine Racer’s gorgeous graphics and redesigned rolling courses are certainly worthy of its popular predecessor. With a giant vertically mounted 55” HD monitor, virtual skiing has never looked so good. 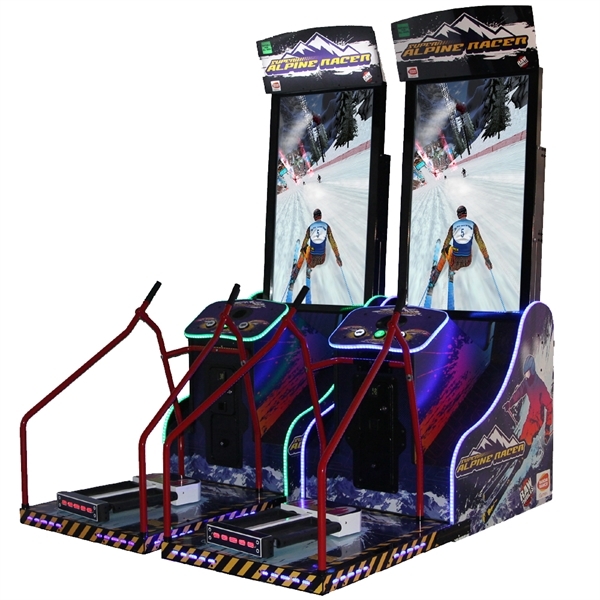 In addition, Namco has used cutting edge technology to create a multi-pivot platform to simulate the movements of downhill skiers, while simultaneously blasting air from built-in blowers to create an incredible life-like skiing experience. Power through the gates to gain additional boosts in speed to rocket past opponents, and perform insane tricks and jumps along the way. If you enjoy water sports, Rapid River will really float your boat – it’s a boat games simulator giving you the opportunity to ride (safely) in white water. The players are seated inside a boat, and need to paddle hard to negotiate the obstacles and keep off the rocks. The boat itself responds to the waves and water conditions, jolting and jerking just like the real thing – it’s an amazingly lifelike sensation. Fun to take part in and fun to watch, Rapid River is unique among games simulators. 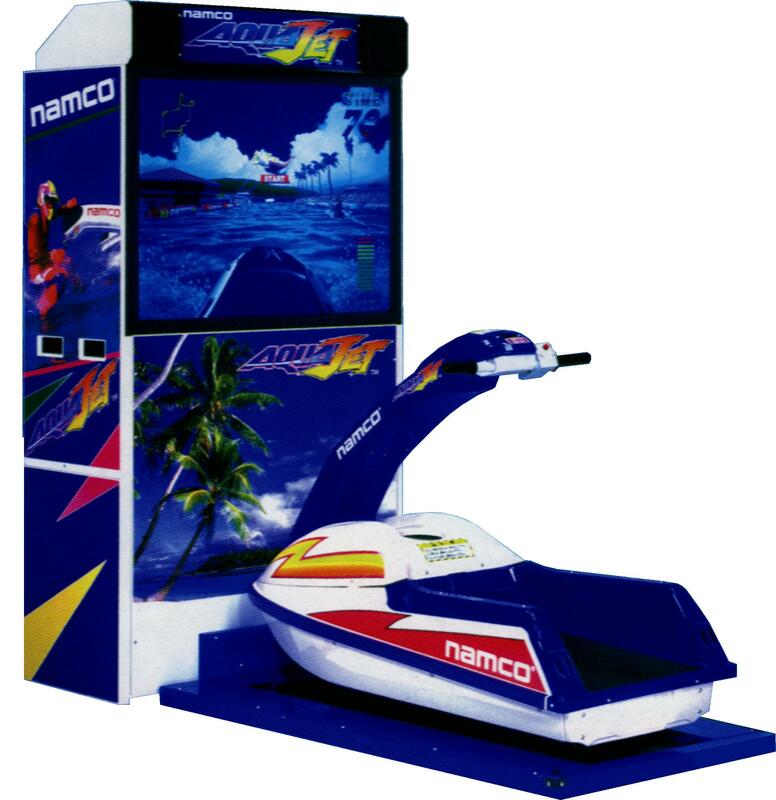 This games simulator involves riding on a life-sized Jet Ski and racing against the clock to complete a lifelike course – you will actually feel the waves hitting the Jet Ski as you perform turns to miss the obstacles in the water and land after jumping the ramps. It’s so realistic you’ll wonder why you don’t get wet when you take part in this ultimate water sports adventure. Your guests will be keen to take part in this beach party game, racing each other to achieve the best possible time – Aqua Jet is the perfect entertainment for all ages. X Games Snow Boarder is Raw Thrills’ latest extreme sports amusement title, a 2-way linkable deluxe racing simulator that sends players hurtling down Iceland’s icy peaks and tricking off the sandy dunes of the Sahara. X Games Snow Boarder features impossible stunts, heart-pounding speed boosts, upgradeable snowboards, and huge multipliers for massive scores you can share and compare online. Each modern-styled simulator includes a durable, realistic snowboard controller, thousands of LED lights, and a realistic wind generator. Sega Rally 3 – The classic game returns! It’s been a long time coming, but 13 years after the original debut Sega Rally twin has returned! In what some might call the holy grail of racing games, Sega Rally 3 twin builds on one of Sega’s most successful franchises and takes it to the next level! 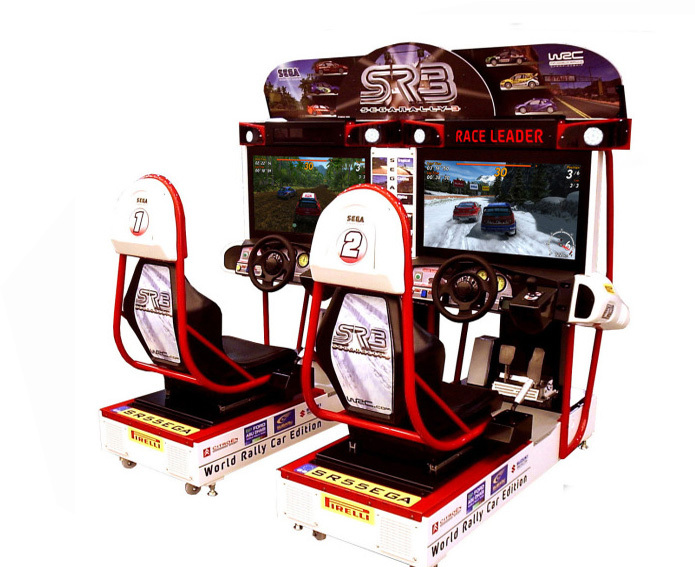 Sega Rally 3’s sleek new twin cabinet was specifically engineered for this game and whilst featuring the latest 32” HD LCD monitors it pays homage to previous cabinets with red roll cage bars and cool white mouldings. Daytona USA 2 is a high-speed stock car race games simulator where the player sits inside the stock car and has a multiple-angled view of the course. There are 3 courses available, each varying in difficulty, but all involving the need to master skidding and sliding to get around the course. The video screens display superb 3D graphics, and you will actually see the tyres smoking as the car skids around the course. 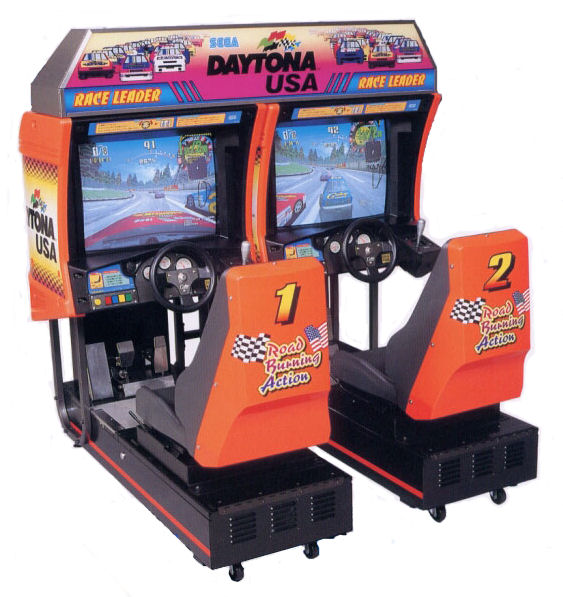 The players’ nerve and driving skills will be tested to the limit in the Daytona USA 2 arcade game – it is a driving simulator like no other. The aim of the game is to complete a course as quickly as possible, beating the times of the other competitors. Your guests will be queueing up to take part as it’s not every day you get the chance for some high speed driving with no traffic cops or speed limits to worry about. Who wouldn’t jump at the chance to drive a Ferrari? 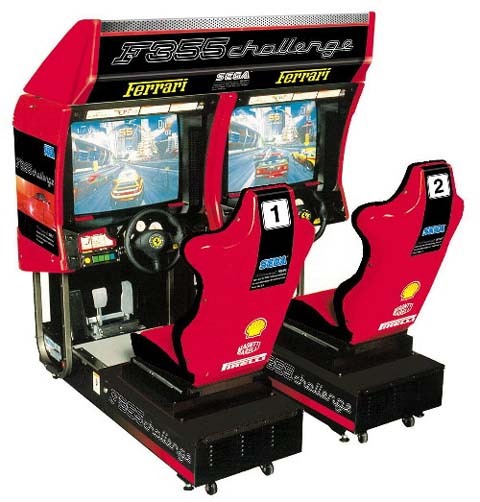 Well, this is as close as most people will get to driving one – The Sega Ferrari 355 Twin games simulator features a true to life driving seat, sophisticated graphics and realistic steering wheel and gear changer. 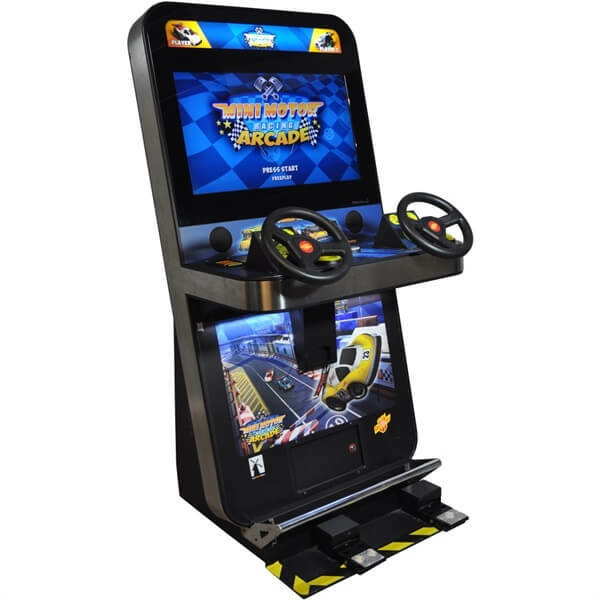 The aim of the game is to complete the course in the fastest possible time, and if you hire more than one of these machines, they can be linked together – up to 8 players can race, adding to the excitement and making sure the competition is as hot as the cars. Whether you’re a driver or a spectator, Ferrari 355 will thrill and entertain all the Ferrari fans out there. Brand new and better than ever! 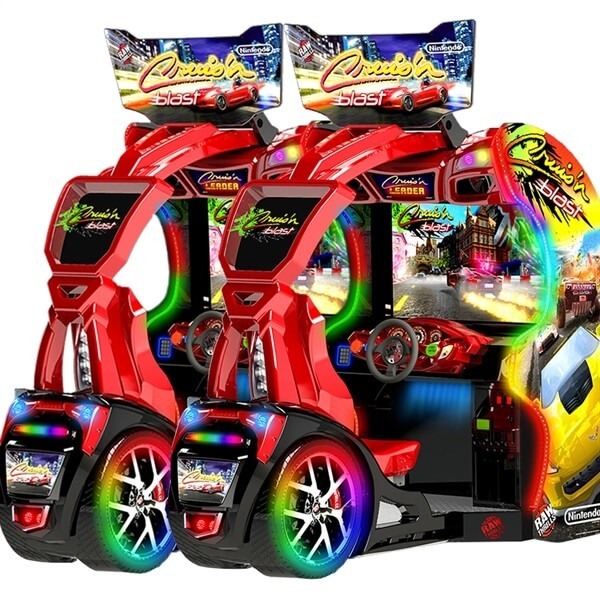 The next game in the extremely popular racing series is here with new courses, new game modes, new karts, new features and a rainbow LED lit cabinet featuring a 42” HD monitor. The popular Nam-Cam feature that places the player’s face over the kart has been updated with “Funny Face Frames” where players can stretch, squeeze, and transform their faces into many different appearances. the game has three game modes: Grand Prix, Versus, and Co-Op. 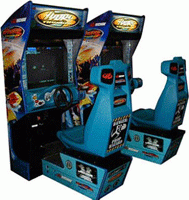 In Grand Prix mode, players can compete through 40 rounds over five selectable cups. Versus mode offers competitive racing excitement for all players. The new 2-Person Co-Op mode features “Fusion Karts.” One person drives while the other “shoots” other competitors. 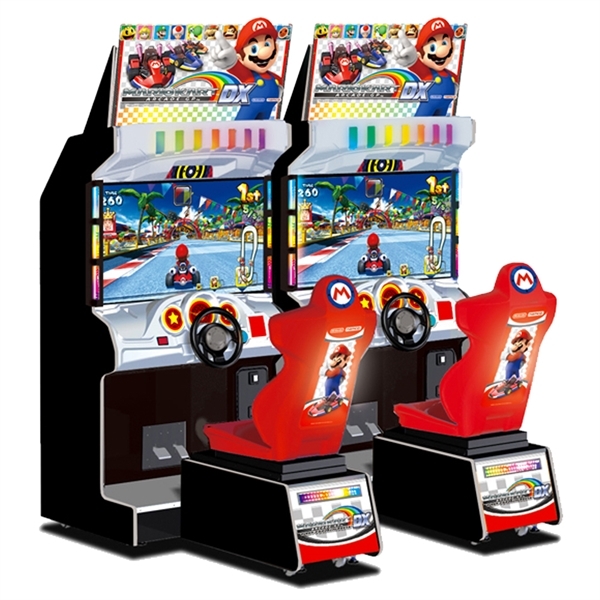 With over 20 types of karts that can specifically trigger over 90 types of items, the racing possibilities of Mario Kart Arcade GP DX are endless and players will be coming back to play again and again. 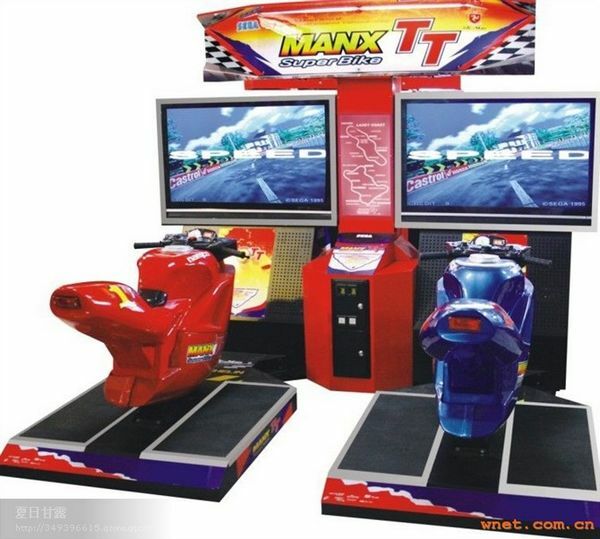 The Isle of Man TT course is the most difficult in the world for motorcycle racing, and our Manx TT games simulator is the best arcade game for motorcycle racing fans. 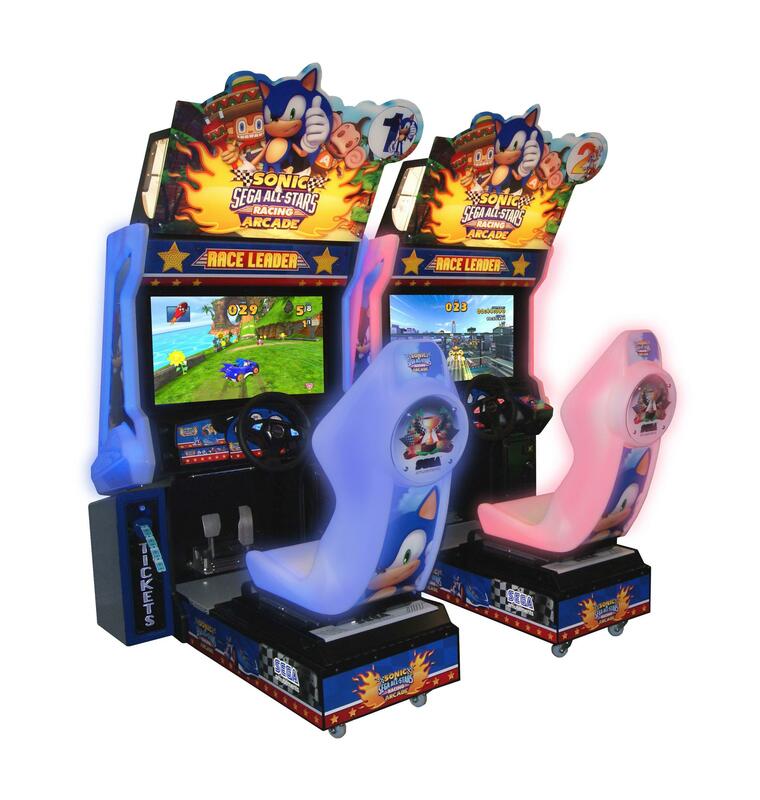 Fast and exciting, 2 players race together and can reach simulated speeds of up to 200 miles per hour. The players sit on motorcycles that they can tilt from side to side to enable them to get round the bends at maximum speed, and the whole spectacle is exhilarating for the players and the spectators. 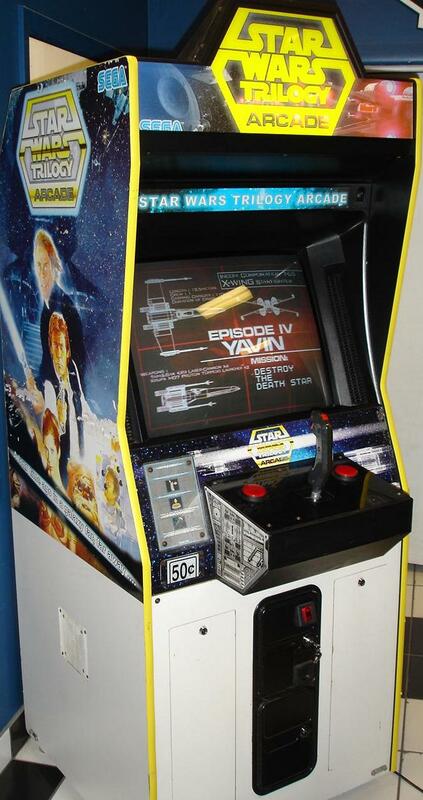 A classic arcade game that has never gone out of fashion. Hydro Thunder and its water-based racing throw a much-needed curveball at the sometimes bland arcade racing genre. The game's real life physics, gorgeous graphics and extensive track list make this one a must for racing fans. With two racing head-to-head it is more than double the fun. 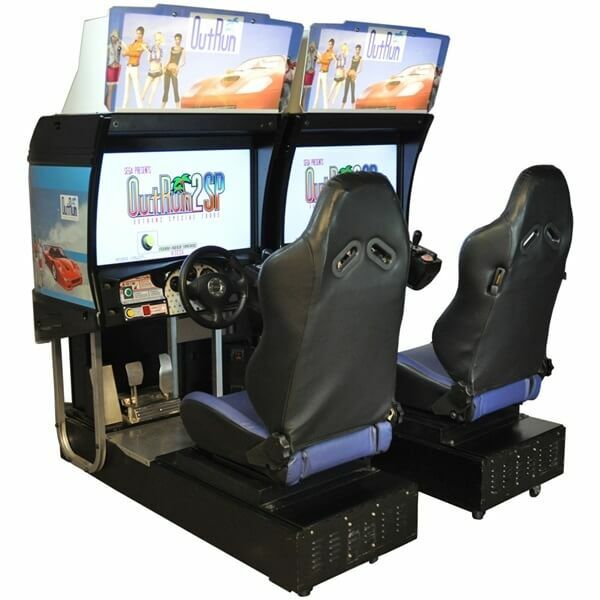 A brilliant arcade racer, Sega Outrun 2 was released in 2003 and boasts beautiful graphics, stunning gameplay and a selection of some of the world’s finest and fastest sports cars, including the Ferrari Enzo and F50. Loyal to its popular predecessor, Outrun 2 is similar to the race format offered in the original Outrun, based on high speed, drifting and good fun. Our engineers have converted the units to feature top-of-the-range flat screens and plush racing seats for a superb racing experience. With a superb soundtrack to drive to, this is the complete arcade racing experience and is fantastic to play alone or with friends in versus mode. Race around a mini rally track as if controlling a remote control car. High speed and lots of crashes results in fast paced races that everyone can enjoy. Striker Pro is that rare beast, an interactive football simulator that will have the whole family putting their skills to the test. On one of Striker Pro's three levels of competition, players can choose the national team they want to represent on a 39-inch hi-resolution flat screen monitor. 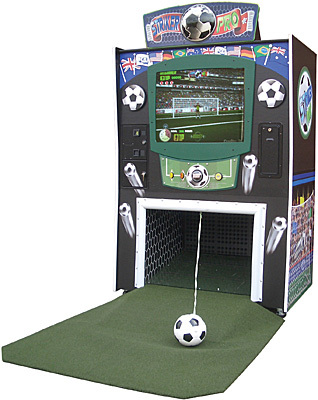 Players must beat a top-flight goalkeeper from a series of increasingly demanding positions, including the tricky over-the-wall free-kick challenge using Striker Pro's unique swerve feature. Innovative sensor technology and superior video technology record and play the action while exclusive instant replays show players' most (and least) impressive attempts. 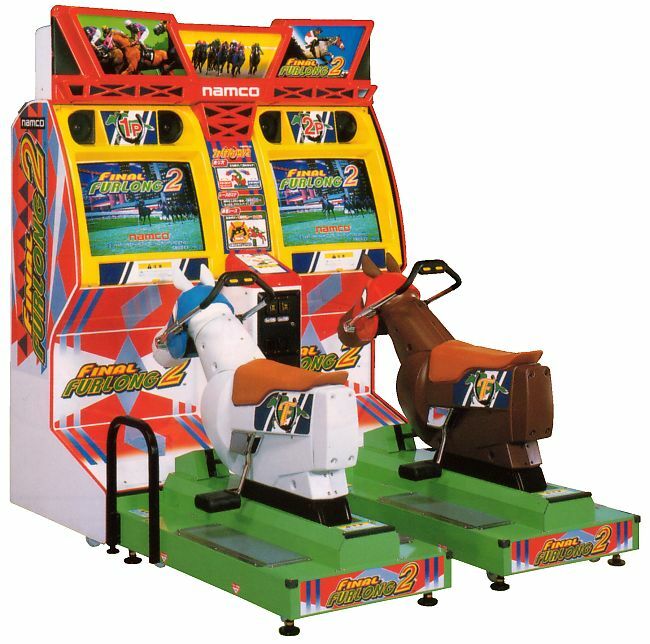 Horse racing games are always popular, and Final Furlong 2 is the best horse racing games simulator available, which is why we hire it out so often for parties and functions. The players are the jockeys, and they race side by side in a realistic horse race simulation. The aim is (naturally) to cross the line first, and with Final Furlong, there is no need to groom or feed your mount afterwards. Applying the latest technology to a popular proven theme, Photo Finish Racing is a new midway-style ball rolling horse racing game in which players jockey for position in the starting line-up, then roll their ball up the straight aiming for sets of holes which determine whether their virtual horse advances up the track with a trot, a gallop or a sprint. The race is broadcast in high-resolution graphic animation on a colossal 47-inch LCD screen, complemented by tension-building audio effects and authentic race commentary. 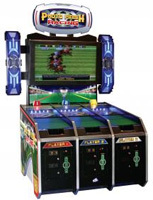 Offering solo or group play, Photo Finish Racing is available in three- or five-player formats and configurable for redemption ticket payout, first-past-the-winning-post amusement only or alternatively unattended midway-style prize redemption width. A video bowling alley that makes use of sensors to translate real rolls into the software. The playfield length is the same as on classic alley games. Lane Master comes with 3 monitors. 1 for each player (the game supports multiplayer), and an additional monitor in the middle marquee area that shows the scores for both players. This monitor also allows the operator to display custom promotional video/image content. 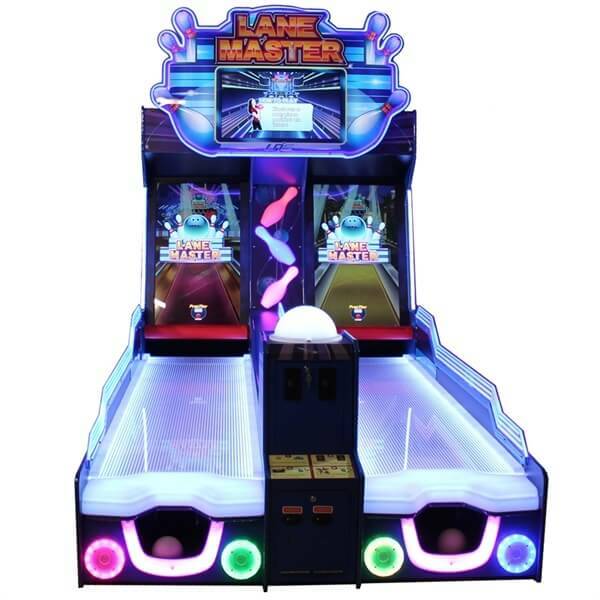 The game uses traditional bowling rules with the overall style of the software matching the sleek neon lights of the physical cabinet. The gameplay is occasionally spiced up with special bonus games that would not be possible in a real life bowling alley. The history of amusement video games is replete with memorable characters, but it would be hard to find two bigger than Mario and Sonic. 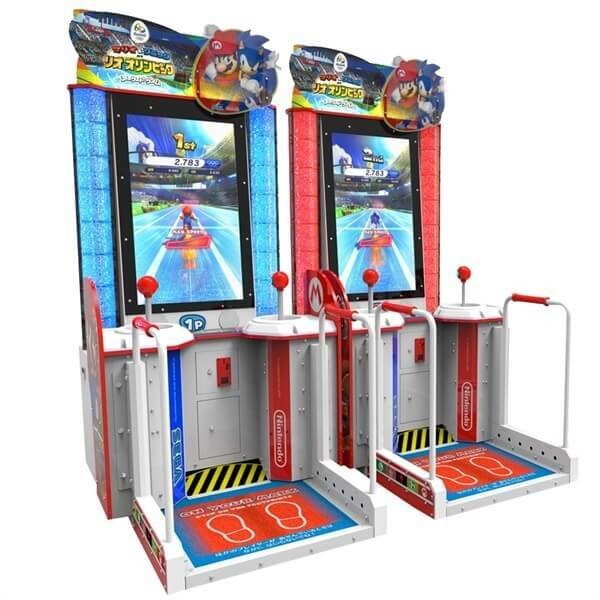 Mario & Sonic at the Rio 2016 Olympic Games™ ARCADE EDITION takes these two iconic characters along with several of their most well-known and best-loved friends to Rio to compete on the world stage of Rio 2016 Olympic Games. Players compete using one of 8 different characters including Mario, Luigi, Wario, Sonic, Knuckles, Peach, Tails and Shadow. Each character has a different set of characteristics including power, speed and balance. The action takes place in the Olympic Stadium where players will challenge each another in 8 different events including 100m, Javelin Throw and Archery. A must have for any Wimbledon inspired event, Virtua Tennis 4 boasts superb graphics and gameplay amidst the world's greatest venues. 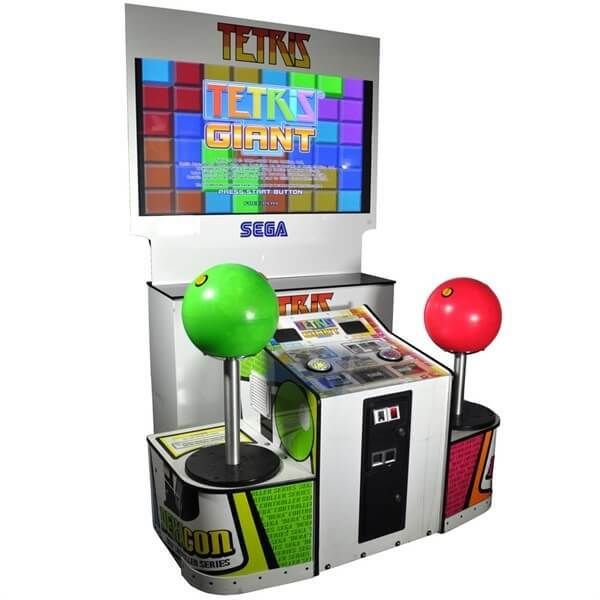 Simply the best game to hire for any Olympic or Athletic-themed event, Sega Virtua Athletics allows players to partake in classic Olympic events including the 100m Sprint, Long Jump, Shot Put, High Jump, 110m Hurdles, and Javelin. 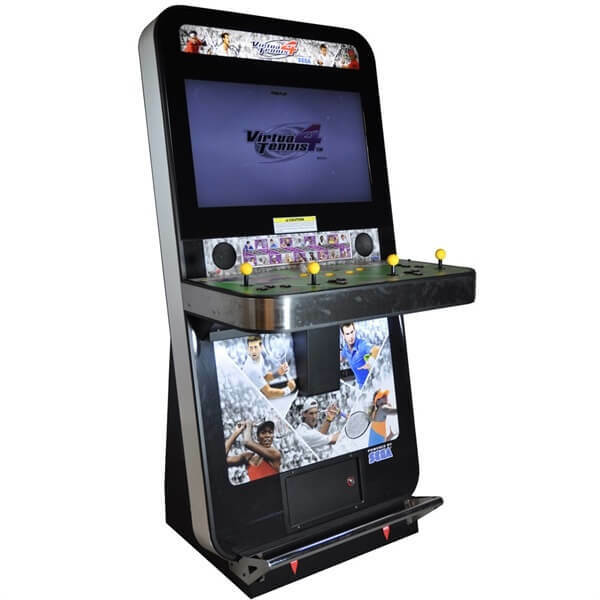 With excellent gameplay and graphics boosted by our engineers, who have modified the games with brand new LCD monitors, this is the most realistic athletics arcade game on the planet. Play head-to-head with friends and family for Olympic gold and world records! Afterburner Climax™ is the jet-fuelled sequel to Sega's 1980's hit Afterburner™. Now coupled with Sega's powerful Lindbergh hardware platform it gives greater depths of plays and photorealistic graphics. Afterburner Climax™ features top fighter planes from the modern age including the F-14D Super Tomcat, F-15E Strike Eagle and F/A-18E Super Hornet. The game also features over 20 stages including Extra and Secret ones. Players will be subjected to Critical Commands throughout the stages to test their skills. An exhilarating fighter jet experience! 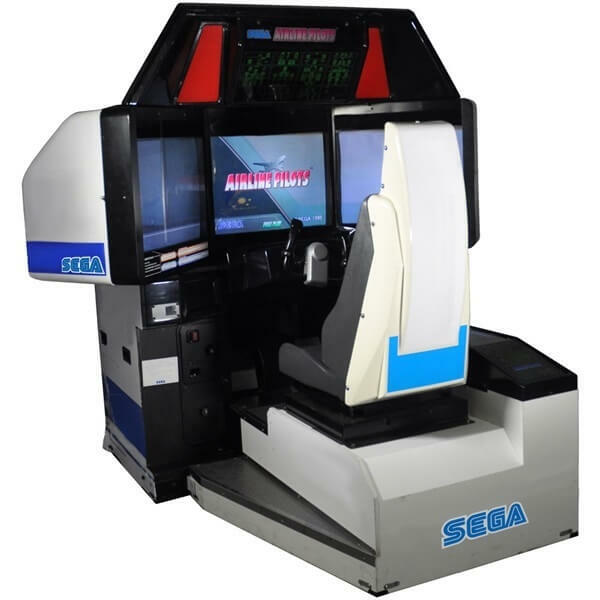 The most realistic aeroplane simulator ever made, Sega Airline Pilots is known for its stunning graphics and incredible feedback controls. 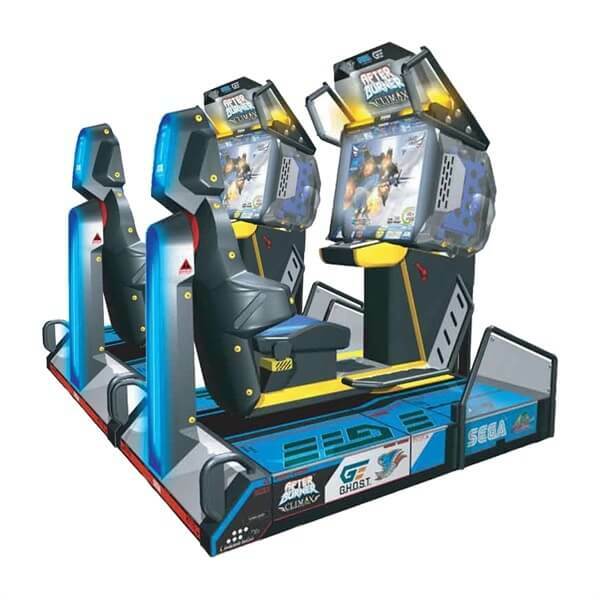 This game takes the arcade flight simulator to a new level, having been developed in cooperation with Japan Airlines. Using 3 29 Inch high resolution monitors to give the pilot a panoramic view, the cabinet is designed to look exactly like the cockpit of a commercial airliner with flight controls, steering wheel, accelerator and brakes. Learn how to pilot a Boeing 747 in the training mode, and then take to the skies, flying towards targets, learning how to steer, and mastering the tricky landing system. A day in the life of a real commercial airline pilot. 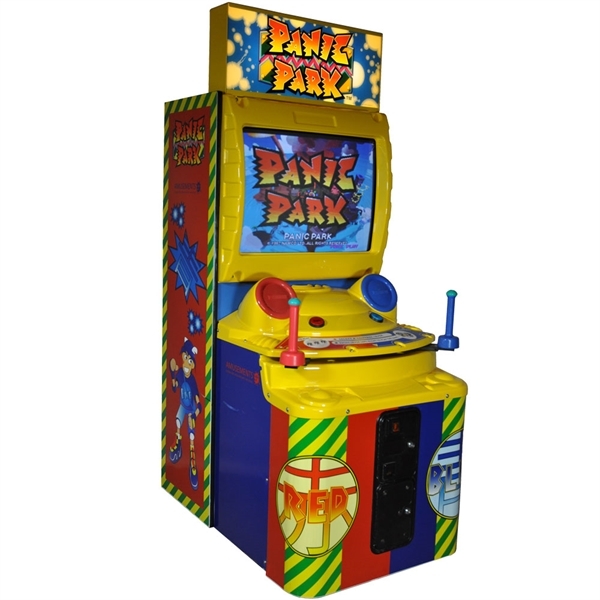 Panic Park is a superb collection of mini-games for one or two players, with the player’s main controller being a lever that shifts left or right on a single rail. The terminal features both control levers on the same rail, with players often jostling between themselves during play to gain an advantage. Difficulties range from easy to hard, with the mini-games randomly selected by the computer. Each mini-game comes with its own set of rules and challenges. There are a number of different types of games to choose from, including racing games, obstacle courses, carnival games and much more. 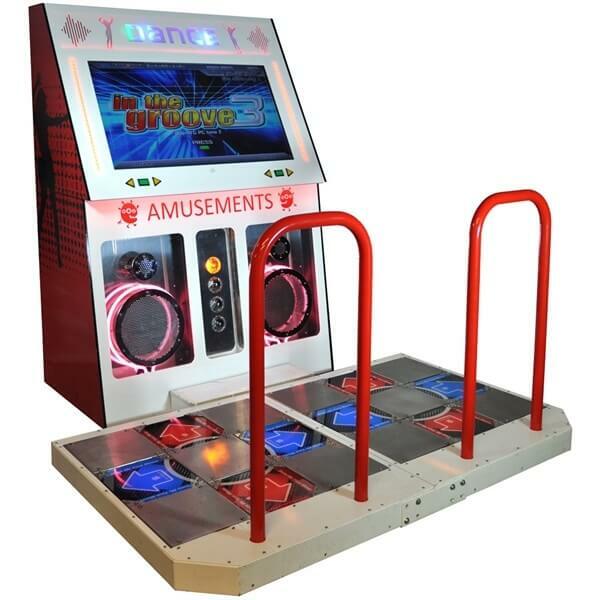 The latest installment in the classic Konami dance series, In the Groove, allows players to dance to a huge selection of music videos, accumulating points by timing their dance steps perfectly. 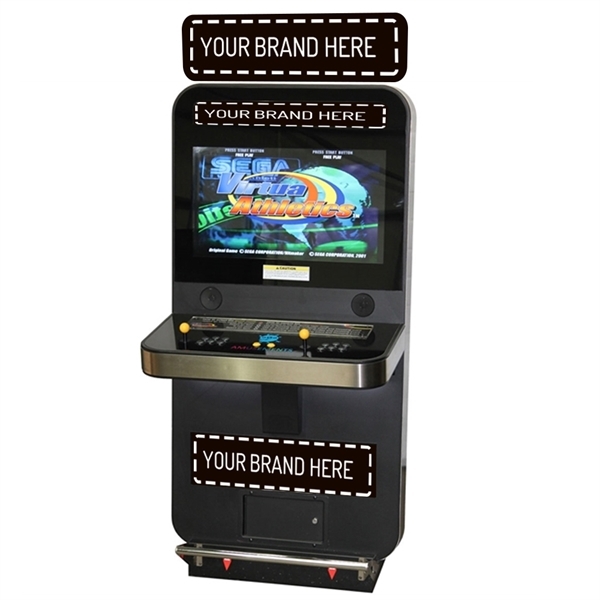 With our customizable machines that can be branded with logos, images and slogans, this is one of the best arcade dance games on the market and an entertaining experience is guaranteed. Have you ever wanted to play your favourite game on a video billboard? Well here is your chance to play the classics like you never have before. 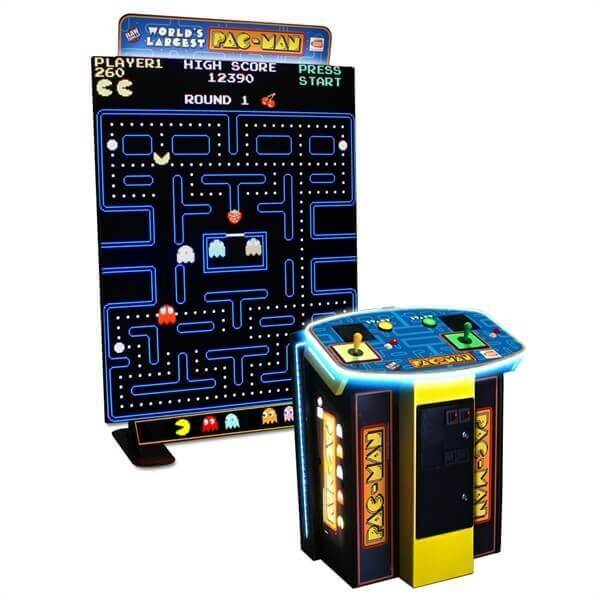 BANDAI NAMCO and Raw Thrills will light up your room with the World’s Largest PAC-MAN. World's Largest PAC-MAN comes with a unique advertisement feature which can be played during the games "attract mode". To use this feature, simply upload your advertisement files on to a USB flash drive and insert into the podium unit. 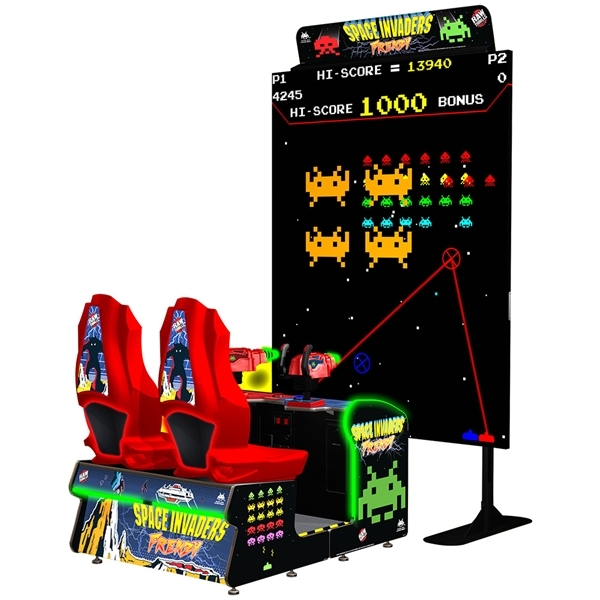 Space Invaders Frenzy is an updated take on the original iconic arcade classic “Space Invaders”. The objective of the game is to shoot as many invader ships as possible while protecting your “cannons” at the bottom of the screen. The player by accumulating as many points as possible before their cannons are destroyed. Points are accrued by shooting enemy invaders and bonus UFO ships. If a player reaches the targeted score to beat, they will win the “Invader Bonus”. Players will also get to enter their name on a high score table if they place in the top 10. Fancy yourself as the Pinball Wizard? Pinball machines have always been a favourite with kids from 6 to 60, and are as enjoyable now as they were in their heyday in the 1950s. Everybody loves flipping the flippers, hearing the dings and buzzes as the points rack up, and keeping the little silver ball in play as long as possible. Innocent fun for all ages, pinball machines will keep your guests amused for hours. It’s always a good idea to hire more than one to ensure everybody gets a go, and your party will go with a swing (and a ding). Everyone has their favourite Star Wars film, and this Star Wars games simulator enables you to act out your fantasies and complete a mission. The game has options for three distinct missions, which are scenarios taken from the original Star Wars trilogy. As the game goes on, the missions become more difficult, culminating in a Light Sabre fight with the evil Darth Vader – a serious challenge for even the cleverest gamer. 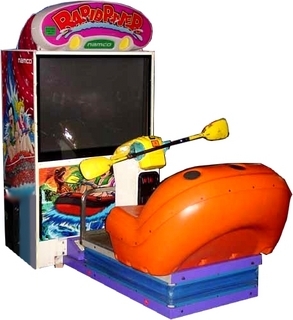 To spice up the action, the machine plays original music from the films, and this arcade game is an all-time favourite as players compete to save the universe.